While America’s craft-brewing renaissance typically gets all of the headlines, the increasing popularity of wine is hard to ignore. Between 2005 and 2015, annual wine consumption in the United States has grown from 692 gallons to 913 million gallons based on recent statistics. Millennials with plenty of money to spare are largely driving the trend, accounting for roughly 50% of all wine purchases in any given year. If you don’t feel like building a vineyard from scratch yourself, becoming a sommelier is a great way to cash in on this bonanza. What Is a Sommelier, Anyway? In a nutshell, sommeliers are service industry professionals whose specialty is knowing everything there is to know about wine. They usually recommend specific wines to diners on a one-on-one basis based on their preferences and food choices. They typically work in upscale joints that place an emphasis on a quality experience. They often collaborate with restaurant or bar owners and chefs to create wine lists that complement the fare and ambiance of any given establishment. A stellar sommelier is effectively a sherpa that guides their customers to the top of the wine appreciation mountain. The amount of money that a sommelier can expect depends on official job title, credentials and experience. 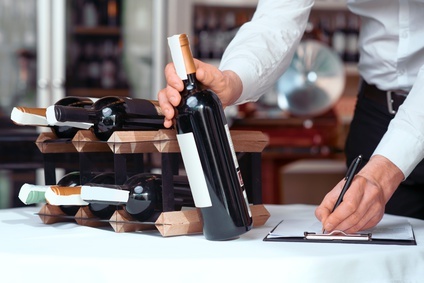 A full-time Master Sommelier can clear up to $150,000 annually at the right establishment. An Advanced Sommelier could earn $80,000 or so if the stars align. Obviously, a sommelier in Des Moines won’t make as much as one that works in Manhattan or Miami due to local cost-of-living and economic factors. Regardless, even a part-time sommelier can command a great hourly rate when all is said and done. Before embarking on the quest to become a part-time sommelier, you should seriously consider the upsides and drawbacks of the gig. On the one hand, sommeliers can make a boatload of money on a per-hour basis with the right training and position. Furthermore, the networking possibilities can be endless if you know how to work a crowd. On the other hand, landing a job that will deliver those perks requires a lot of education and effort that won’t always yield immediate dividends. A good sommelier has a varied skill set that’s all over the map and includes both intellectual and instinctual prowess. For starters, you need to know pretty much everything about wine to get your foot in the door. Beyond that, you need to have a great sense of smell and a great sense of taste to identify the subtle differences between wines based on their vintage and flavor or aroma profiles. The ability to size up a wine enthusiast and recommend the perfect bottle for them in any scenario takes time and dedication to develop. Even though sommeliers can be self taught, it’s hard to break into this industry without some serious training. The good news is that there are a number of sommelier courses offered around the country that are flexible and affordable for the most part. You can spend anywhere from $500 to $5,000 on professional studies depending on your end goal. The Court of Master Sommeliers offers an introductory course for just $525 that should get you on your way to becoming a journeyman sommelier. Sooner or later, you’ll need to get an official stamp of approval from a respected sommelier organization. The American chapter of the Court of Master Sommeliers offers four levels of certification. The brass ring will always be Master Sommelier. To obtain this rating, you’ll have to complete years of study and pass fairly grueling exams. It’s not an exaggeration to say that getting into Stanford might be easier than securing a Master Sommelier designation. However, a Certified or Advanced Sommelier ranking is well within the reach of most. At a certain point, all of the education in the world won’t help you to land a plum job if you don’t display some initiative. You’ll need real-world experience and gumption to lock down a sommelier post. That’s why working as an apprentice sommelier during your studies is so helpful. Some of the best mixologists in the world started out as bar backs for illustrious bartenders. You can use the experience you’ve gained to back up your know-how when approaching restaurant owners. When the time is right, ask nightlife proprietors for face-to-face meetings and impress them with your expertise. In many ways, a good sommelier is something of a celebrity showman throughout the wine world. That’s why a flamboyant personality and a go-getter mentality are your best assets. Create a website for yourself that’s all about your sommelier experience, skills and ruminations. Post on your blog regularly. Tie it all together with social media accounts on Twitter, Facebook and Instagram. You can’t think of yourself as a mere employee. You have to present yourself as an entity that makes all things wine that much better. A pedestrian sommelier is fine with being tied to one or several restaurants and taking home their nightly cut of the tips. A truly entrepreneurial sommelier is always thinking of ways to expand the pie. Great sommeliers can make top dollar working private parties, weddings and company events. One could even use YouTube videos centered around wine appreciation to make affiliate sales commissions on items like corkscrews, decanters and glassware. Ultimately, a person with an extensive knowledge of wine can find a million ways to profit if they’re a creative thinker. Despite its staid and stuffy image, wine is a constantly evolving business that can change quickly if you’re not paying attention. Maximizing your income as a sommelier is all about keeping your ear to the ground. Read industry publications like Practical Winery and Vineyard Journal or Wines & Vines for all the latest buzz. Conduct online and in-person surveys of oenophiles to gauge their shifting tastes. If you keep with the times, a part-time sommelier side gig will be profitable for many years to come.